Is your roof becoming visibly faded and unsightly? It might be time to get it repainted. Roof repainting is a very important part of roof maintenance as a whole. A good quality roof painting job is vital for the appearance and longevity of your roof. Here at Strongguard, we have over twenty years of experience when it comes to roof painting. Our team is familiar with the importance of quality roof painting services, which is why we strive to deliver comprehensive roof painting services. We are experts at diagnosing problems with your roof, and we draw on our experience to match the perfect paint with your roof. We take pride in using only the finest quality products and we paint every roof using reflective heat technology. 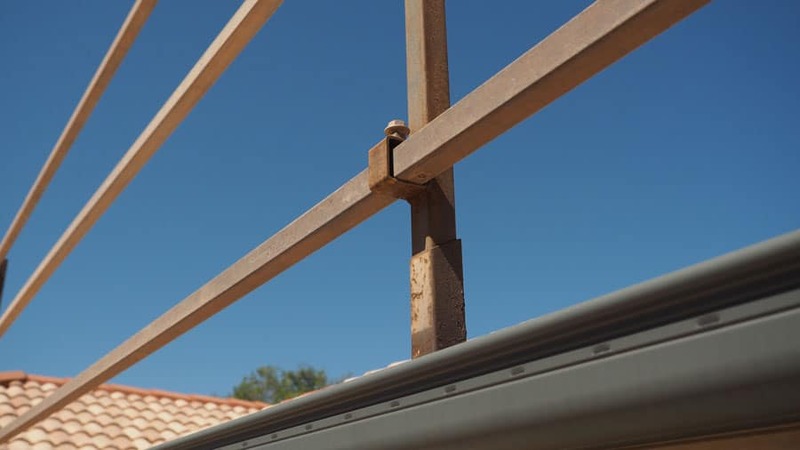 This allows your roof to minimise heat absorption, which adds to the comfort of your home. Despite what you might think, roof painting is actually quite a complex process. To get the ideal protection and finish, there are several important stages that must be completed to a high standard of quality. Fortunately, this is something that we are very familiar with here at Strongguard. Throughout our many years of experience in roof painting, we have identified the perfect roof painting process. To complement our meticulous workmanship, we select paints from the most reputable brands, including Dulux and Shieldcoat. This means that we can guarantee you the best in finish and protection for your roof. For each job we have a team of experienced tradesmen, who are experts in their field. We approach all of our jobs on a targeted basis, which means that we only use paints and procedures that suit your roofs design and construction. At Strongguard, we believe that the roof painting process starts from the very moment you contact us. With so many choices available to you, we strive to offer supportive service, throughout the entire process. When it comes to the painting itself, we have developed a leading-edge process designed to ensure that you get the ultimate finish and protection. Before we commence the painting itself, our team will set up a worksite that includes the necessary safety rails and scaffolding. Safety is always a priority for us, and it gives us the peace of mind to complete your job efficiently. 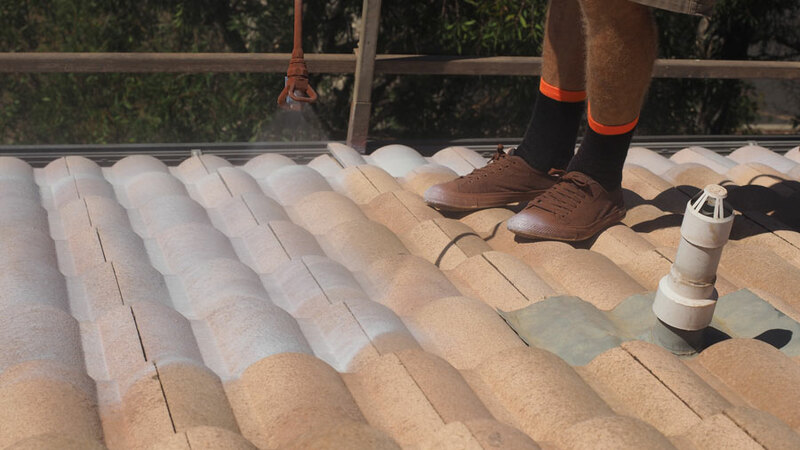 Once the worksite is established, we will clean your roof with a specialised high pressure cleaner. This device operates at a pressure no lower than 3000psi. Such high pressure allows us to clean any imperfections from your roof, leaving a clean surface. For tiled roofs, we have to ensure that there are no broken tiles or caps. If there are any present, then we will repair them prior to commencing. Once all tiles and caps are repaired, we will apply a mould treatment. This prevents mould building up in the future and potentially compromising your paint. Following this, we will hand paint all gable ends and mask any walls off. This ensures that overspray is not a problem. By this stage, your roof will be in the ideal condition to be painted. First we will apply a primer/sealer, which prepares the roof for the following two coats of membrane. We use a highly durable roof membrane that is design to maintain the vivid colour and finish of your roof. As well as this, it also protects the paint and the roof from the weather. Once the entire process is complete, we will provide you with your ten-year warranty. This warranty extends to both workmanship and roof membrane. Has the time come for you to get your roof painted? If so, then contact the team at Strongguard today. 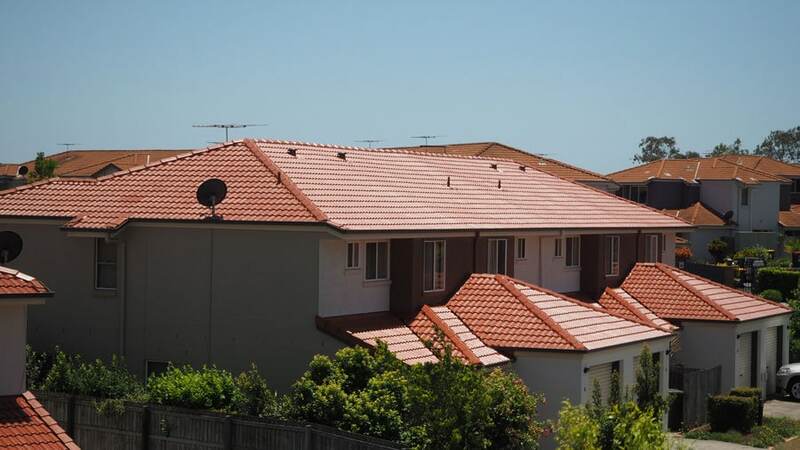 We lead the industry in roof painting across Brisbane Southside and we have over twenty years of experience. Our selection of paint is second to none and we will happily work with you to match you and your roof with the perfect paint solution. #1 Can you help me change the colour of my roof? At Strongguard, we offer a selection of over 70 paints. This means that you have the option of changing the colour of your roof. So if you would like a roof that reflects your design preferences a little more, then get in touch with us today. #2 How long does it normally take to paint a roof? Generally speaking, it takes our team of experienced roof painters between two and four days to complete a job to perfection. Of course there are many things to take into account, but our process is amongst the most efficient in Brisbane’s Southside. #3 What types of paint do you use at Strongguard? Here at Strongguard, we take pride in the quality of our work. As a part of this, we use only the highest quality paints, from brands that we trust. Specifically, we use Dulux Arcatrex and Shieldcoat Roofbond. Over our many years of roof painting, we have come to trust these paints as the best on offer. #4 Do you offer warranty on all of your jobs? 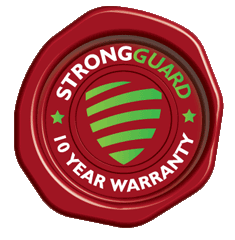 At Strongguard, we offer ten year workmanship and membrane warranties, as a testament to the quality of our roof painting services.